Automation is a trending technology in most industries. 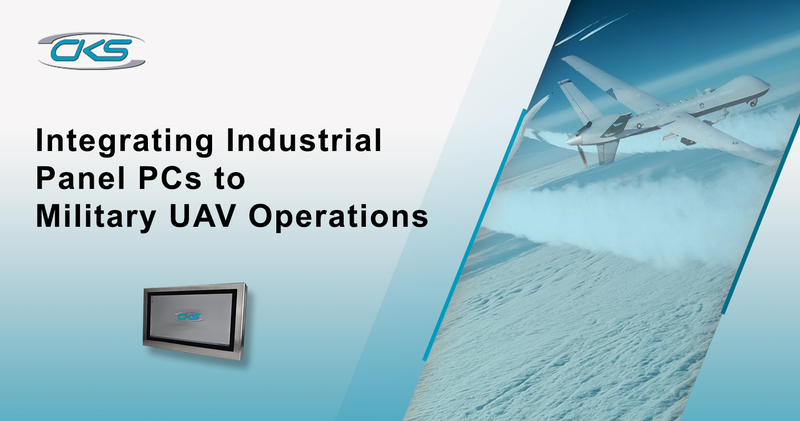 Utilising industrial computers for automated processes allows continuous operations amidst the harsh conditions across different sectors. Automation has become a crucial part in an industrial setup due to its efficiency and cost-effectiveness. It enables the manufacturers to cut down costs by reducing bottlenecks in operations and production time. Moreover, there is also an increased accuracy and repeatability of tasks which makes for a seamless workflow. With these advantages, manufacturers are able to work smarter and faster. In the UK, 68% of manufacturers saw the potential to increase the use of automation equipment in their business. Additionally, 22% of these manufacturers believe that productivity in their operations increased by 20%. But, 36% of the respondents in a survey showed that UK companies would need more information on how automation can improve their business [Barclay]. So, how can equipment manufacturers apply automation on the production floor where harsh conditions prevail? By installing automation software to industrial computers, manufacturers are assured of 24/7 seamless and efficient workflow. Due to the durability of rugged PCs, it can withstand against the presence of harmful substances, extreme temperature, and corrosive elements. Fortunately, CKS Global Solutions provides industrial computers that can further enhance the efficiency and productivity of your operations. 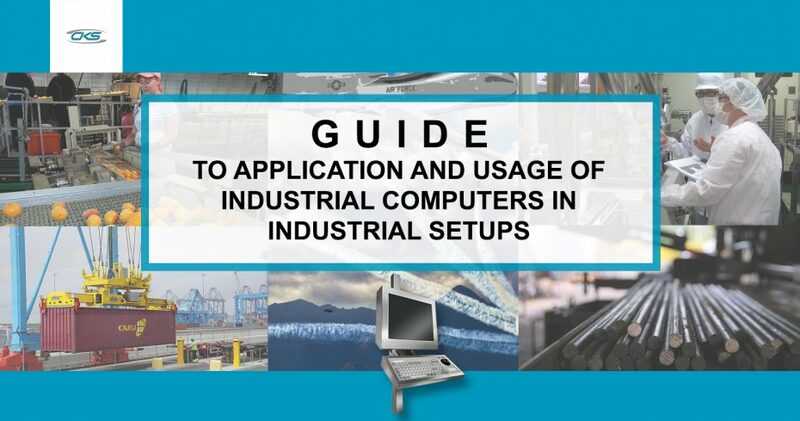 This guide will help you understand how this equipment can be applied across different industries. Automation is an answer to huge manufacturing demands and efficient workflow. But, the stringent working environment in an industrial setup is a challenge to achieve an optimised operation. Hence, integrating automated software to industrial PCs allow continuous operations even in extreme working conditions. These rugged computers are designed with specific form-factors and mounting options built for manufacturing, retail, military and other industrial applications. With its sturdy protection against dust, liquids, high shock and vibration, automated systems are able to deliver its optimal functionality. There are some tasks with different computing requirements. Thus, being able to choose different ruggedised PCs lets you optimise a specific operation. As a result, you will have a more enhanced overall system. 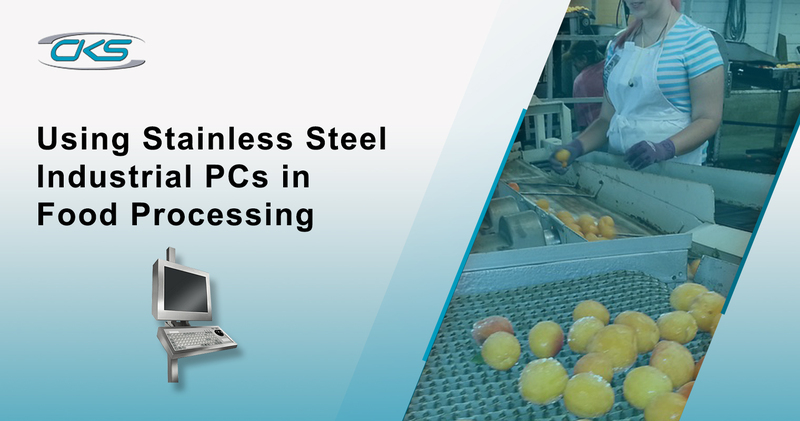 Food processing, logistics, military and retail industries have damaging conditions that can harm a typical PC. An IP65/NEMA4 sealing grade ensures that internal components are protected from harmful environmental conditions. In industries where heavy machineries are present, operatives would need to prioritise saving workspace. Industrial PCs, such as a panel or embedded computer, have a compact footprint. That way, other essential technologies can be easily installed in operations. So, having these features make industrial computers a versatile and sturdy solution for automation in a rigorous working environment. To understand the applications and advantages of rugged PCs in different industries, find out more on the next sections. Application of automation and robotics are becoming more prevalent in the food and beverage sector. As it becomes more sophisticated, food manufacturers are able to utilise it for tracking products and consumer demand. UK’s food and drink industry is the largest manufacturing sector in the country. It adds a £110 billion a year to the economy. Plus, the advanced R&D assets in the industry make the country a global exporter to an increasingly discerning market. With this, key stakeholders would need to utilise a system that enhances productivity and efficiency. There are several challenges that food processing companies face when it comes to deciding the appropriate technical advancement for their facility. Daily compliance with food safety regulations whiles hitting target production rate is important. Moreover, there is a need to increase the scale of manufacturing to meet market demands. Investing in the right technology lets food processing companies maximise production whilst being able to reduce costs and inefficiencies. Likewise, the most appropriate solution to enable seamless automation is to utilise industrial-grade components. Given the fact that food processing plants bear a hygienic environment, food processors are required to wear gloves. Most touchscreens, however, will only work when used with bare fingers which may be a hassle to the gloved hands. But, an industrial PC with projected capacitance can still be operated whether bare or gloved fingers. As a result, operators can continue to monitor information and automation process without compromising sanitation on the production floor. What’s more, screens with this touch technology is scratch-, dust- and water-resistant. To keep up with the global competition, food processing plants would need to increase their scale of manufacturing. This involves integrating new machineries for production. So, being able to save workspace and seamlessly installing computers for automation in different areas is crucial. Fortunately, our industrial computers are VESA-compliant which makes it easy to install in different work areas. These rugged PCs has a compact footprint that allows tracking and monitoring of operations in machineries and other small areas. In compliance with food safety standards, the temperature in food processing facilities is controlled to inhibit bacterial growth. Work areas have extreme temperatures which can prevent a typical PC to perform properly. Our industrial-grade computer is built to function and withstand temperatures from -5°C to +50°C. So, expect efficient automated operations even in harsh working conditions. 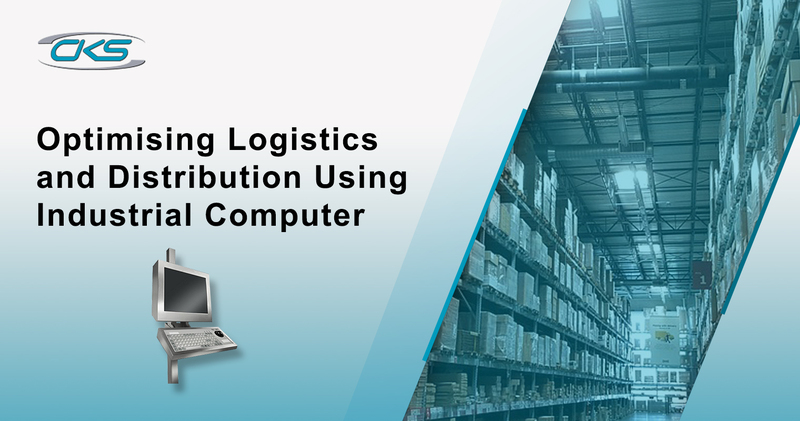 More than being an economic contributor, the logistics and distribution industry supports operations of several sectors through distribution and movement of goods. As the businesses grow, they heavily rely on distributors with efficient logistics operations. Thus, logistics companies would need to optimise their systems for dynamic operations. With several technological innovations changing the industrial landscape, the distribution and logistics sector quickly adapted. More so, companies in this industry need to utilise these technologies to keep up with the changing consumer behaviour. Now, one of the trends that prevail in this industry is the use of automation systems. So, how can companies make use of automation and seamlessly integrate it in their operations? Automation can definitely help logistic companies and distributors to deliver goods in a faster and more cost-efficient way. But, selecting the right technology for automation is usually no easy task to do. And, it would be ideal to choose a computing technology that is applicable for long-term solutions to improve competitive advantages. Another important consideration when deciding on computing technology is the environmental conditions in a distribution floor. Harmful elements can be visible including extreme temperature; the impact and vibration from conveyor systems; dirt, dust and liquid intrusions. Logistics and distribution operate 24/7 and require high accuracy even in a fast-paced environment. But, integrating an industrial panel PC for automation can address this issue. This computing device features an IP65/NEMA 4 sealing. Its components and enclosure have the capability to resist extreme temperatures, shock, vibration, dust and dirt. Therefore, this results in higher productivity as it prevents downtime usually caused by technical malfunctions whilst continuously hitting target yield. Distribution and logistics centres handle large orders of goods. Without proper tracking and warehousing management, this results to fulfilment errors and additional operation costs. Thus, an industrial-grade PC is the most ideal solution. It is built with an Intel® Core™ i7-6700TE 2.40Ghz, allowing faster data analysis. It can quickly handle and analyse large amounts of data at an efficient rate. Having an optimised automation also means utilising a technology that is built for long-term availability in operations. Our ruggedised computers have a 3-year warranty with extendable options up to 5 years if required. This means that you needn’t keep purchasing new computers for automation. Over the years, unmanned aerial vehicles (UAV) have become a significant military advantage. From military logistics to reconnaissance, UAVs have improved operations and security of operatives. With this, it is crucial to integrate ruggedised components in the military systems to ensure streamlined UAV operations. UAVs provided significant advantages in reconnaissance, surveillance, logistics and many other military operations. These UAVs are monitored and controlled from ground base stations. In a typical ground control hub, computer consoles are required for the aircraft operator and payload operator. Computing technologies utilised for UAVs need to be able to process a huge amount of data in a quick and efficient manner. Smooth and organised information and data transmission are important in the military. In a network-centric setup, delivering critical data to authorised personnel has driven the need for ruggedised computer systems. It also needs to be considered that the working environment in a military setup can pose threats to computing technologies. The presence of extreme temperatures, shock, vibration, dust and liquid intrusion. Another consideration is that the equipment needs to have the right balance between size, weight and power (SWaP). And, field deployment requires equipment to have efficient power usage. Military setup typically entails harsh working conditions that can harm non-rugged equipment. This is the reason why our industrial PC has an IP65/NEMA4 sealing. Its enclosure can withstand extreme temperature, high impact, dirt and liquid intrusion. So, hardware failure is avoided and continuous data transmission and monitoring from UAVs can also be performed. Timely acquisition and transferring of information from UAVs is also necessary. So, it is crucial for the computers to have a mechanism that can detect and recover possible malfunctions. Now, our ruggedised PC is equipped with a watchdog timer. Early detection of hardware or program error prevents possible loss of critical military gathered by UAVs. So, expect that any hindrance may occur can be detected easily. Field operations in the military typically work in various environment. Having a ruggedised PC with high brightness display allows readability under tough ambient conditions. This prevents critical errors in terms of data input. At the same time, operatives are able to monitor and track UAVs smoothly. Technological innovation in the steel manufacturing industry has evolved from basic open-hearth processing to the use of automation, robotics and computer models. Manpower has been reduced as well due to the new technologies that emerged. This resulted in safer operations whilst greatly improving productivity. Henry Bessemer was a British engineer who made a breakthrough in producing steel, thus, creating the “Bessemer converter”. This breakthrough, however, only produced brittle steel since it could not remove phosphorus present in iron. So, in the 20th century, Swiss engineer Robert Durrer developed a process that combines the advantages of the Bessemer Siemens-Martin furnaces. As a result, steelmakers produced high-quality steels. Today, steel production increased immensely using robotics and automation. As a matter of fact, the quality of steel greatly improved as well due to the use of these technologies. One of the key challenges in steel production is proper utilisation of floor space. Heavy machineries in steel-making would take up a larger footprint. This means that monitoring and tracking tools for automation may not be accommodated. In addition, it has to be considered that the production floor also bears challenging conditions. This includes extreme heat, dust, dirt, high impact and extreme vibrations. And, these elements are definitely damaging to a typical computing device. So, how can companies make full use of automation in their steel processes whilst keeping a competitive advantage? An ideal solution is to install industrial computers on the production floor for automation. Industrial panel PCs are designed for industrial applications including the steel manufacturing sector. The great advantage about this device is that it has the capability to provide its functionality despite its extreme working condition. 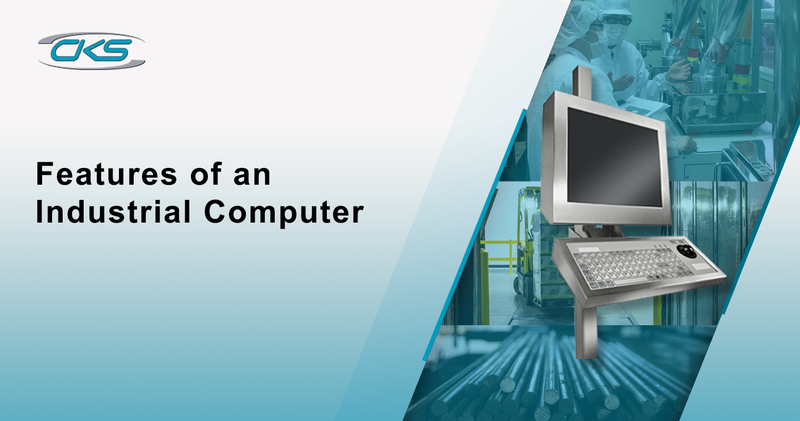 Here are the key specifications of an industrial computing device. Maximising ROI in steel production means reducing operational costs and simplifying data management. Our industrial computers have different thin client options to meet your steel operation needs. It is a cost-efficient terminal that runs on a centralised server. Software and information management are easily maintained and managed since upgrades and changes can be done in one data centre. 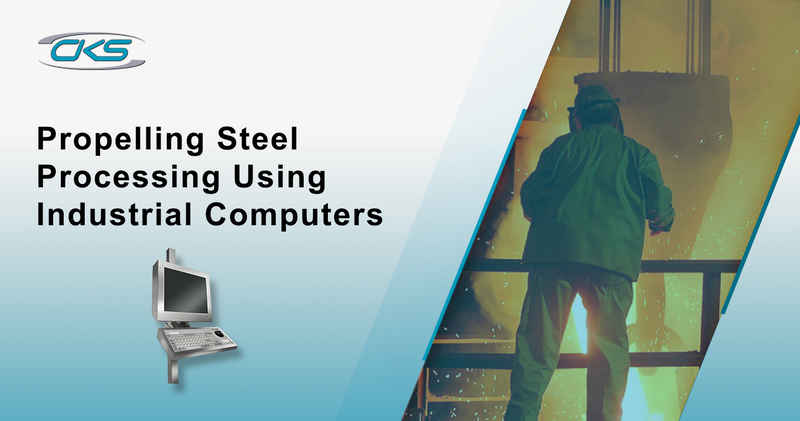 Due to an extreme temperature that is present on the steel production floor, computing technologies might malfunction in the middle of operations. Fortunately, our ruggedised PC has thermal control options such as an external waterproof fan assembly to extend to +50°C. This regulates the temperature of the internal components and prevents unexpected hardware errors. Since steel production has heavy machineries involved, strong impact and vibration can damage typical PCs. Our ruggedised computers have a panel PC option with projected capacitive touchscreen technology. It has a 2.1mm tempered glass which makes the screen durable against scratches. Plus, operators are able to seamlessly navigate and monitor application processes. Different industries are now making use of automation and advanced technologies to their systems. Manufacturers, logistics and distributors need to keep pace with the global competition and the changing market demand. The military industry is also optimising their systems to improve every aspect of their workflow. But, these industries have varying working conditions that can be a hindrance to fully utilise automation. Our industrial computers are built for heavy industries, which make it a perfect solution for any industrial setup. Call (+44) 01438 747111 to get the right computing system for your business operational needs.